CANADA! #MilkUnleashed This Holiday w/ A Giveaway! My family loves milk, I mean, seriously, my husband alone can drink a gallon of it if I let him. Me, I'm not too big on milk, but I do make sure I consume enough so that my bones stay healthy and I do make sure that the kiddos get their daily servings each day. Since the holidays are just around the corner, Milk Unleashed once to help out since they know these times are filled with family trips, dinner parties, gatherings and so much more. They are going to giveaway a prize pack to one of our Canadian readers so that your family and you can enjoy milk wherever your family is. Don't know what Milk Unleashed is? No problem. Milk Unleashed provides you with shelf stable milk that you can take with you anywhere and doesn't require refrigeration until after it's been opened. 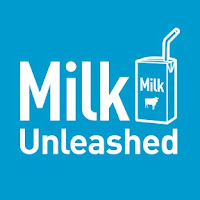 To learn more about Milk Unleashed be sure to pop on over to their website. I'm super excited about it as my kids love to drink milk and putting these milk boxes in their lunch is going to go so well for mommy. Be sure to check out and browse the Milk Unleashed App below and take the Family On-The-Go Quiztacular to enter our giveaway! Disclosure: All opinions are my own. I will receive a milk prize pack in exchange for this post/my participation, no other compensation will be received.